Study up on zombie-related holdings at the Cornell University Library before the Zombie Apocalypse. Halloween is coming, too, prime time for the undead! Here on Cornell's campus? Do some first-hand zombie research and have some fun! Here are two events coming up at the Cornell Cinema! On October 28, 2017 you can go to a costume party and then watch the classic zombie documentary Shaun of the Dead! Event link. You can also view the uplifting tale of star-crossed zombies: Night of the Living Dead! Two chances to catch it, October 31st and November 2nd. Event link. Remember, there is safety in numbers! 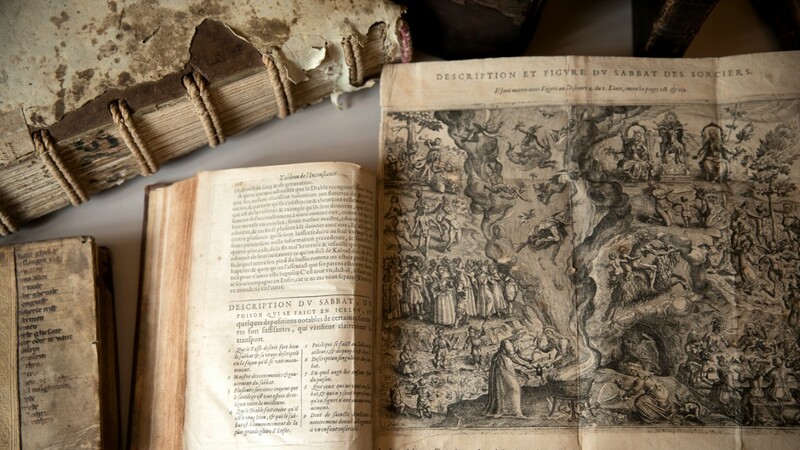 Cornell Witchcraft Collection exhibition opens on Halloween! as well as 21st-century ​witchcraft movie posters to illustrate how popular views on witches have evolved over 500 years. An opening reception, which is free and open to the public, will take place Oct. 31 from 4 to 5:30 p.m. on Level 2B, Kroch Library. In case of a zombie attack, it is generally considered safest to stay indoors. Luckily, you don't need to venture out into danger to research your zombie foes. Use almost all of Cornell University Library's resources right where you are! All you need is your netid and password. Check out my Zombie Survival Guide!